Classic quarter mile run-what-you-brung drag racing will soon be a thing of the past in Los Angeles county. With the coming demise of Los Angeles County Raceway, and the never ending march of the red tile roofed homes into what was once the middle of nowhere, the state of the California drag strip is in peril. Not so at Sacramento Raceway. Even now they host a Saturday test-and-tune, and every summer the track throws a vast array of internal combustion freak outs. The jet car burn at the annual Nights of Fire event is not to be missed. 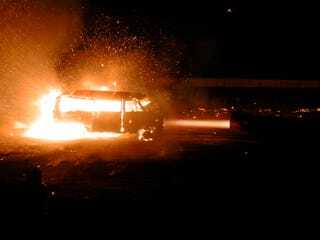 Above is a shot of a Chevy van being incinerated while chained to the back of a jet dragster. The year before toasting this van into oblivion the crew melted a 'mino from a Ford Ranchero. The AA/Fuel slingshot nitro racing was bitchen too. Support your local dragstrip!